I would like to present to you my Four-in-a-row game. The interesting point (I believe) is the simple way the interface communicates with the engine. The engine is a console application. It receives a string as parameter, which is the history of the game (a sequence of characters from "1" to "7"). The program returns its move, using the same convention, and closes. So, if someone would to develop his own engine, without wasting time to make an interface, he could easily reuse that one. The package contains also code to make an engine play against another a given number of games. Here is an example. It's an engine that plays random (but legal) moves. I use it to test the strength of my main engine. PRINT "0" ' or it returns 0 if the string was unvalid. Thanks to dodicat for his cairo DLLs and examples. The latest version of the game uses the Velena engine by Giuliano Bertoletti. Last edited by Roland Chastain on May 06, 2018 16:07, edited 3 times in total. Since you used cairo for drawing it's easy to build a GTK+ GUI around that code. Find an (old-schooled) example in the Scribble source for GTK+-2. It gets more simple when using GTK+-3, since this version has inbuild cairo features. And this application is a right-sized example to learn about I18N (= internationalization, in a professional way). Find a working example in .../examples/GUI/GTK+/FB_Calc/ (includes FB source code and all utility files, for en/de translations in this case, GladeToBac was used to support the *.pot file creation). A very professional implementation of the game and show case for FreeBasic. When I run it Windows 8 gives a warning that it is an unknown publisher. I have a touch screen and tried pressing the buttons with my finger instead of using the mouse but without success? Touch screen input makes programs suitable for running on a tablet and your implementation. I began to look at GTK, and I could compile some examples, helped by the indications that you gave here and there in the forum. Thank you for your support and observations, John. My next project is to rewrite my chess program following the same method. I believe this is the key to progress in chess programming : I mean to have under the hand a ready-to-use interface. The string of numbers could be replaced, for example, by a string using the Forsyth-Edwards notation. It would be much easier to use than the protocols like XBoard or UCI (on my part, I am still unable to use them). And it would allow an effective collaboration between FB programmers, and even more, since with that method the engine can be written in any language ! Still intend working on your chess program. For me playing with the chess program was learning how they did it and writing one would have been more about showing myself I understood how they did it. As a hobby programmer I see it more of an exercise in puzzle solving. This is more like I might have tackled the Four In A Row game using the fb graphics to roll my own GUI. I haven't tested it enough to iron out all the bugs but it sort of works. The only AI however is to block a potential four in a row or make a four in a row for a win. Otherwise its moves are random without any strategy or analysis of the game state. draw string (TLX+40,442)," A B C D E F G"
draw string (50,34)," White to Move "
draw string (50,34)," Black to Move "
win = findWin(player) 'result in win? block = findWin(-player) 'result in block? win = findWin(player) 'was that a winning move? draw string (50,34)," ORANGE WON "
draw string (50,34)," YELLOW WON "
Last edited by BasicCoder2 on Oct 13, 2013 9:10, edited 1 time in total. Roland Chastain wrote: It would be much easier to use than the protocols like XBoard or UCI (on my part, I am still unable to use them). Great! I didn't remember that you have made that. I will look at it. Thank you, VANYA! Last edited by Roland Chastain on Apr 12, 2015 5:31, edited 1 time in total. 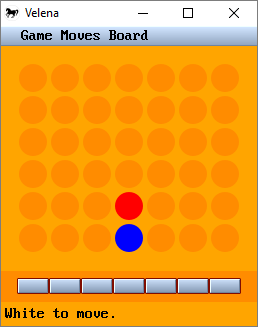 There is a new version.The main difference is that you can choose between two opponents, the simple engine that I had made for the first version (just changed to a dynamic library) and Velena, a program which plays connect-four perfectly (also changed to a dynamic library). Last edited by Roland Chastain on May 06, 2018 11:33, edited 2 times in total. Hi Roland! The game is an excellent! Many thanks - this is an excellent piece of work - love the gui and it is great to be able to use Velena again. I'm still working on my program but might see if I can hook it up to the gui - if you can give me an tips or advice. Thanks again for the excellent implementation! Thank you for that very interesting contribution. The bug that you reported is fixed (please download the new files here). Your engine looks great! I downloaded it here and will study it. It will be easy to hook your engine up to the GUI, whether as a command-line executable or as a DLL (if ever you like that idea). I would be glad to help. For your information, here is the protocol used by Velena. Velena is called with one argument, a string beginning with "a", "b", or "c" (weak, normal, strong) and ending with "0". In the middle, the sequence of moves already played, e.g. "44442" (equivalent of "D1 d2 D3 d4 D5 b1"). The return value is the column as an integer from 1 to 7, or a negative error code. Great, thanks for fixing so quickly - downloaded! Yes, would be very grateful for your help with this - thank you! - I will need it.